​Join us every month for a new Create + Sip experience! Our afternoons of wine and fun offer more than just painting. Each event is taught by one of Workhouse's talented studio artists, so we play with lots of techniques. You'll have a great time creating (and sipping), resulting in a unique piece of art made by you. Check our Events listings regularly to see what we'll have next. Batik is an art form that uses wax as a resist to create line drawings in dyed material. 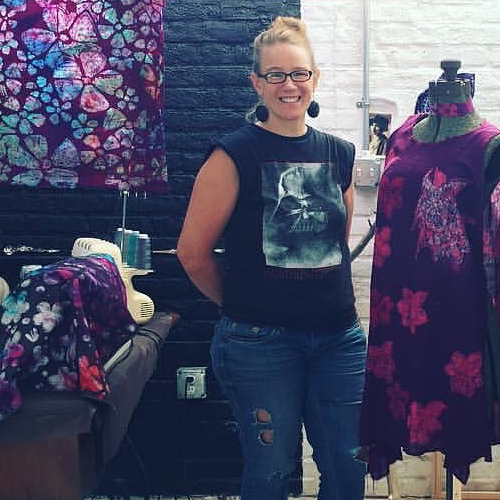 During this Create + Sip, Workhouse fiber artist Cheryl VanderMolen Neway will show you how to batik a mandala symbol onto cotton fabric with soy wax. You'll also learn how to use dyes to create a sunburst effect in the background. When you're done, you'll have a beautiful piece of wearable art that you can take home with you (or turn it into a wall hanging -- it's your choice!). PLEASE NOTE: While we provide aprons, dyes can splash easily -- and they are permanent! Wear clothes and shoes that can get messy.